(Phys.org) —Using state of the art computer simulations, a team of French astrophysicists have for the first time explained a long standing mystery: why surges of star formation (so called 'starbursts') take place when galaxies collide. The scientists, led by Florent Renaud of the AIM institute near Paris in France, publish their results in a letter to the journal Monthly Notices of the Royal Astronomical Society. The new simulations were made using two of the most powerful supercomputers in Europe. The team modelled a galaxy like our own Milky Way and the two colliding Antennae galaxies (see e.g. this Hubble Space Telescope image of these objects). 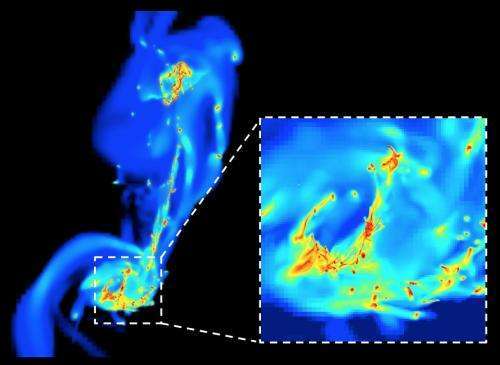 Florent comments: "This is a big step forward in our understanding of star formation, something only made possible by the similarly major and parallel advances in computing power. These systems are helping us unlock the nature of galaxies and their contents in ever more detail, helping astronomers to slowly assemble their complete history." "This is a big step forward in our understanding of star formation, something only made possible by the similarly major and parallel advances in computing power."